Swimming pools can be a fun family asset to your backyard. However, before considering such fun in the sun, it’s a good idea to talk with your homeowner’s insurance agent to be sure you have coverage in place. 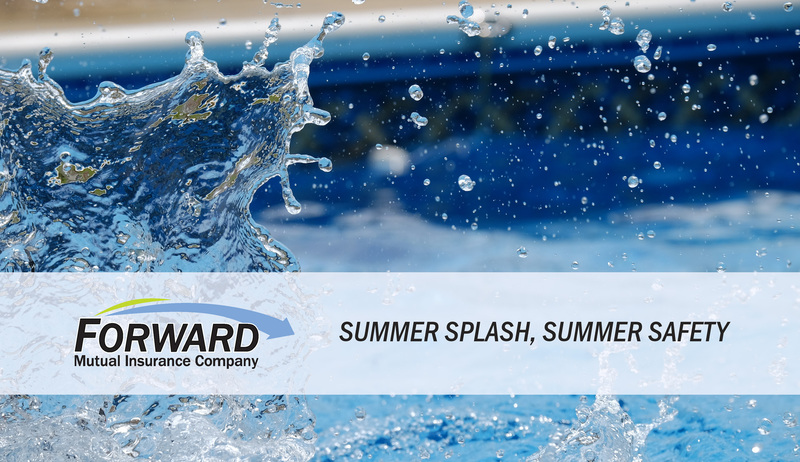 Your Forward Mutual policy offers coverage for swimming pools, however, depending on your policy and also your pool setup, coverage may be handled in different ways. An above-ground pool is generally covered by the personal property coverage in a homeowners policy, while an in-ground pool is usually covered by other structures coverage. Your agent is happy to help you determine how your pool will be covered and whether you should consider increasing your coverage limits based on the value of your pool and any accessories, such as a deck or water slide. For insurance coverage, Forward Mutual requires all pools be fenced in and secured with a locked gate. If your pool has a slide, it may or may not be insurable. Again, it’s important you discuss your pool with your agent and have it inspected. Like trampolines, a swimming pool is considered an “attractive nuisance.” This means it might attract a child and pose a risk to that child’s well-being. If you are the owner of a pool, you are liable for anyone who uses it, whether they have your permission or not. According to the Insurance Information Institute (III), liability protection is a standard part of a typical homeowners policy, but because a pool can increase your liability risk, you may want to consider increasing your coverage. Your agent can help you determine whether you have enough protection in place. According to the American Red Cross over 200 young children drown in backyard swimming pools each year. Extra vigilance is necessary for you as the owner of a pool. Enclose your pool with a 4-feet or taller fence with a self-closing, locked gate. Supervise children at all times and within arms length. Never allow anyone to swim alone. Learn to swim, both you and your children, from Red Cross courses. Maintain your pool’s structure and water. Regularly test and adjust the chemical levels. Learn CPR. Ensure everyone in the home knows how to respond to aquatic emergencies.